Why not Add a Piccolo to Your Arsenal and Vary Your Attack! 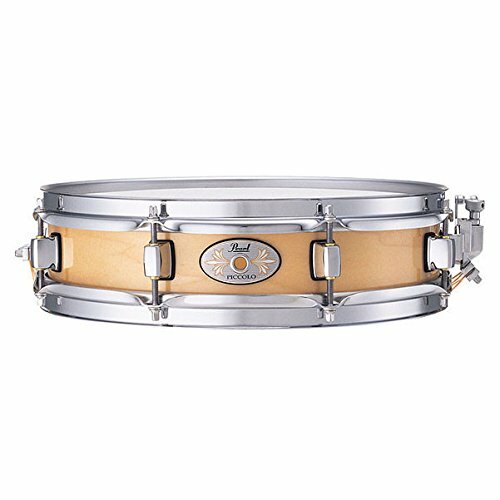 Drummers tend to collect snare drums more than any other piece of the sound puzzle. Snares have tremendous individual “personality,” and none have more than the often overlooked it. Piccolo snares are shallow snares, usually just 3 inches deep, and rarely wider than 13 inches, which is the most prevalent width. Experienced drummers know a piccolo, often used as a secondary snare, can be used to fantastic effect. Maple piccolos deliver super high, super crisp sound that cuts through the din with great projection and plenty of crack. Shining, high-spectrum attack is the chief characteristic of the piccolo snare, as it delivers an “alternate” voice to the featured snare, and gives the drummer the flexibility of tuning the featured snare looser to cover more tonal ground. Dimensions - 14 x 3 x 14 inches. It can be used for a primary as well as be used as secondary drum. Very solid hardware, easy to tune, and on the top of that good looking. All in all it produces superb sound regardless of whether you play it with sticks or brushes. Conclusion: Great quality on great price you will be amazed. High crisp and pitch sound. Durable, easy to tune. I really can point out any cons. This is pretty good deal for the price. This instrument is a superb way to personalize your drum kit, adding to your attack, and giving you a sound uniquely yours. Pick one up and have fun tuning it high, low, and in between until you find just the right sound for your style. Wanna learn something about some more nontraditional drums like the Djembe Drums?